Bulk cooking is what people with large crowds or families do, right? When I say bulk cooking, do you think of a giant 10 litre pot on the stove or eating the same meal 7 nights in a row? It really isn’t like this and suits all sizes of families and lifestyles. Let me walk you through a scenario with and without bulk cooking to show you how it can help you. You probably don’t have to think too long or hard to imagine that feeling when you have to cook after arriving home from a long day at work, chores or activities; exhausted and ready to crash. Summoning the energy and time needed to cook dinner, even if you’ve done some meal planning, seems impossible. This is when convenience/processed foods or take away win out as they seem so much easier. I get it. But they do come at a cost to your wallet and your long-term health. Often take away is full of additives and preservatives that can have you and/or your kids feeling crotchety or dysregulated for days to come. Bulk cooking is your saviour. So let’s rewind and do the scenario over with bulk cooking in the mix. You come home after a long day out. It’s dinner time and you don’t feel like doing anything except sitting down. Don’t worry, you have been bulk cooking and meal prepping! All you have to do is go to the fridge and either take out a meal and warm it up or take the pre-prepared parts from the fridge and throw the meal together. Easy! Investing some time to prepare food for the week can solve the problem of having to think about and prepare a meal when you don’t feel like it. 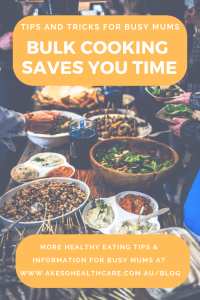 It saves you time and money in the kitchen as you do lots of dishes once (rather than each night) and can often use some components in multiple meals (avoiding wasted food and repeating the same processes on different days). Bulk cooking simplifies your life and helps you to make more conscious, healthy choices, even when you don’t feel like it. What exactly does bulk cooking entail? Bulk cooking can be as simple as doubling the batch of pasta sauce that you make and putting one in the fridge for later in the week or the freezer for another time. 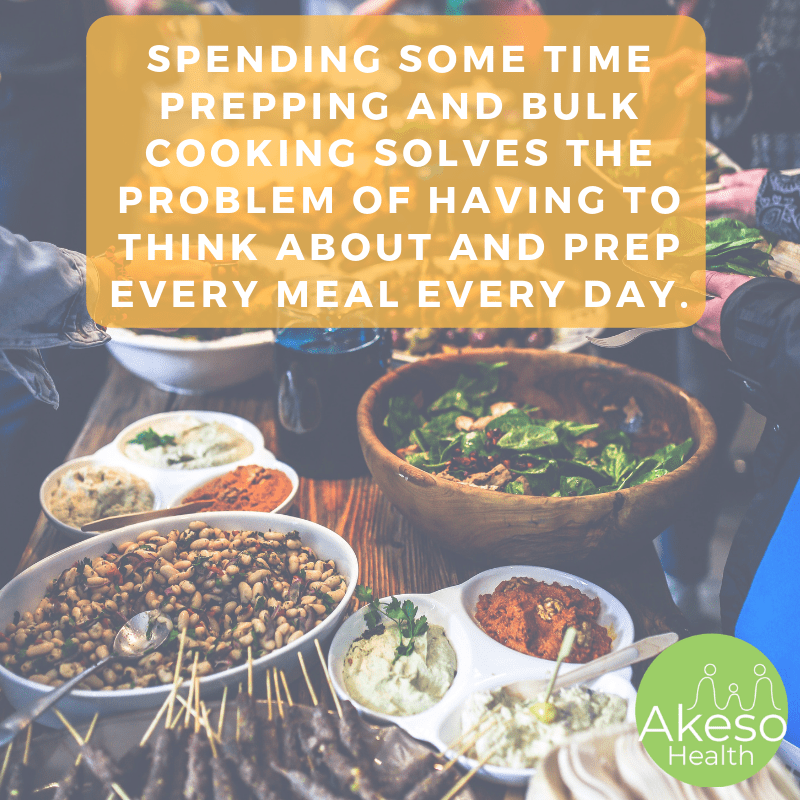 Bulk cooking can also just be cooking vegetables for the week and meals ahead or preparing all your lunches and snacks for the week. It can be as much or as little as you like, depending on how much time you have on prep day and other days of the week. Steps for successful bulk cooking. What recipes can you easily double or triple? (one for now, one for later, one for the freezer. Once you’ve done your meal planning and bought what you need for the week, spend a couple of hours prepping food. Wash your vegetables and fruit and store them in cloth bags or vegetable specialised storers to maximise their freshness. Chop vegetables like carrots and celery into sticks ready for snacks. Store in a container in the fridge or even split into portion size containers/bags ready for lunchboxes. Peel, chop and pre-cook vegetables for the week ahead. EG roast sweet potato, beetroot, cauliflower and broccoli for salads or to be quickly reheated as you cook your protein (meat, eggs, tofu etc) or reheat your meal. For example, preheat the oven, and fill a tray or two with chopped vegetables. (Depending on your oven size you may repeat this a couple of times.) Drizzle the vegetables with olive oil, a sprinkle of fresh/dried rosemary/thyme, and add salt and pepper. Roast for 45 minutes at 200 degrees Celsius (180 if fan is on). Once they’ve cooled down, store in glass containers in the fridge and warm in a fry pan when needed. You can even pre-cook meats using your slow cooker or roasting or slow cooking in the oven. Slow cookers are great because there’s often room to double or triple a recipe. EG my slow cooker holds 7 litres. That’s about three meals worth for my family of 6. One for now, one for later and one for the freezer. Excellent. Even your grains can be pre-cooked in bulk for snacking on or adding to meals and salads during the week. Please be careful with rice. It is a high-risk food when it is cooked and stored for later use. Because bulk cooking relies heavily on cooking and storing food, please read Better Health Channel‘s information on food safety and storage. We don’t want anyone getting sick! Remember the seasonal vegetable list I gave you in another blog? Here it is. Start by picking some of your family’s favourites off the list and cook a few in bulk this week. Make a meal plan for the week. I have lots of tips on meal planning here. Include the vegetables that you’ve decided to cook in bulk for this week. What recipes can you double and eat again later in the week? Make a shopping list. Order online for delivery (easy!) or click and collect (easy too!) or go to the shop. Gather some helpers and get cooking! Enjoy time off from the kitchen for the rest of the week. Woot woot! Need some recipes or ideas to get started? Check out my meal planning blog and my recipes for chicken and vegetable soup, seedy porridge, pickled beetroot and kale pesto. These are either already large or can be doubled or tripled to be used with many breakfasts, lunches or dinners. Don’t forget to look at my Pinterest boards and social media for more recipes and inspiration and share your photos and recipes with me by tagging me in your photos or posting them on my wall. Getting used to this system of bulk cooking will free up so much mental space and time for you. You’ll be amazed. This is how I got through uni with four kids and running a family business. It is fantastic when you don’t have to worry about meals each evening. But you also know that you are providing healthy foods for yourself and your family. Want to get started on your healthy eating journey? Tried everything you can think of to convert your kids to a whole foods lifestyle but they still won’t budge? My passion is to help families thrive through a healthy, whole foods diet. I’m offering Family Wellness Checks to help you learn how to transition your family to this lifestyle. Discover how to reduce you and your children’s risk factors for diseases and prevent future health issues from arising. I have lots of experience converting children to a whole foods lifestyle. 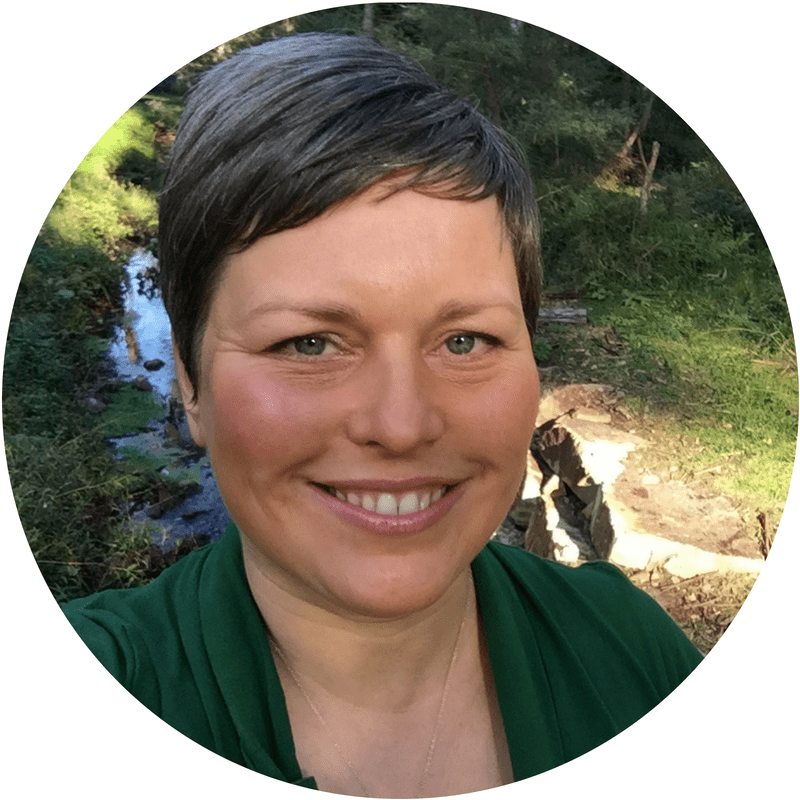 Let me support you through this process so it is easy, whinge-free and doesn’t mean lots of work for you! Don’t delay, start your journey to a healthy lifestyle by booking a FREE discovery call with me.